First up in the brunch line-up, a traditional holiday beverage made just a little healthier. I think eggnog is incredibly tasty, but just way too sugary. I played around with recipes this year and found a healthier variety that is sweet, but not too sweet. Feel free to add or take away from the maple syrup amount to make this to your liking. In a large saucepan, whisk together eggs, 2 cups of milk, maple syrup, and sea salt. Cook and stir over medium heat until the mixture reaches 160°. Remove from heat. Stir in cinnamon, nutmeg, vanilla, and the remaining two cups of milk. Mix well. Pour mixture into a jar, cover, and refrigerate overnight or until chilled. Whip 3/4 cup cream until it is thick, but not yet “whipped cream”. Stir the thickened cream into the eggnog mixture. Serve in glasses. Top with additional whipped cream and sprinkles of nutmeg if desired. Are you an Eggnog lover? love some eggnog, gonna try this. thank you for sharing. This looks fantastic! I’ve actuually never tried eggnog but will definitely make this recipe. Yum, Yum, Yum! I love eggnog and my middle son loves boiled custard! :) Thanks for posting the recipe! Love that its a healthier version and cooked, too. We get fresh eggs from a local lady but I still prefer not to give the kids completely raw eggs. my 6 year old has fallen in love with eggnog. Love that I can make a healthy version that I might actually be willing to give her! Not a fan of eggnog but thanks for including me in your brunch! We sure do love egg nog! Thanks for a healthier version! I love eggnog-just haven’t indulged yet this year…now I will with your yummy recipe!! Thanks! I lovw eggnog but do not usually drink it because of the calories. Your “lighter” version sounds yummy though! I love eggnog and will definitely have to give this a try!!! Anything that uses real maple syrup catches my attention. Yum! I have made a similar recipe and have loved it! So do you think that the eggs are “cooked” enough to be safe? I always feel a little weird about drinking eggnog because of this. We don’t have access to farm fresh eggs, so we just get the ones from the grocery store. I’d love to hear your thoughts on this! 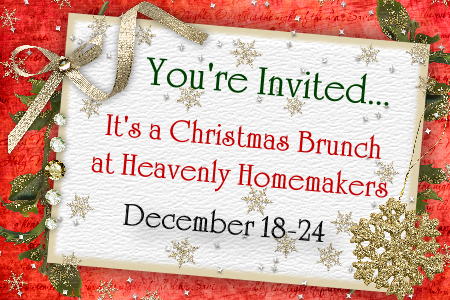 And thanks so much for including all of us on the giveaways for your brunch! So fun! Yes, I’d say the eggs are fully cooked in this, so I wouldn’t worry. I have never liked eggnog, but I think it was because it was just too sweet for my taste. Maybe I should give yours a try! I’d say up to two weeks. never had eggnog but this looks yummy, might have to give it a whirl! It does sound good! I was making my menu plan and this will definitely have a place in it. I can’t wait to try making my first homemade eggnog. Thanks for the recipe. mmm, hubby & i are both into eggnog. for a family get together (with an expecting sister-in-law! ), im wondering if this is unborn-baby-safe? I suppose there is a lot of controversy on that. But what is your opinion? Also, just this friday, a new friend (who is also into eating healthy) insisted that the only good milk to drink is from Jersey cows, and maybe she meant other “old fashioned” breeds as well. She said the popular Holsteins, tho they produce a lot, have a mutant gene that makes their milk bad for us. Have you heard this before? I have looked it up a little but of course you can’t trust EVERYTHING you read ;) Again, just curious of your opinion. thanks in advance! Not a fan of eggnog but love to attend your brunches. I am not a fan of eggnog. But I am sure there will be plenty of other foods/drinks that I will enjoy at our brunch. I do appreciate, though, that you made this holiday drink healthier. Ooo.. I’m sure my husband would love this recipe! I’ve been wanting to search for a recipe as all the supermarket ones have scary ingredients but I love them! So going to try this…putting heavy cream on my shopping list, thank you! This looks wonderful! I will try it this weekend. Not much for eggnog but thanks anyway! I’ve never tried it. And I’m 36 lol. I love eggnog so yes I will be trying out your version. Thanks for all your hard work on your site. I love all the info. Thanks for the recipe. What a great way to start this busy Monday! This sounds delicious and it is without wine – I am rolling around here nine months pregnant so no alcohol for me. I thought this was something that you drink as a warm beverage. Does it have to be cooled? In Germany, eggnogg is with white whine and rum, only a little cream and whipped cream on top – and it’s hot. Think I am going to give it a try! Thank you for posting. Ohh Yum! That looks delicious! 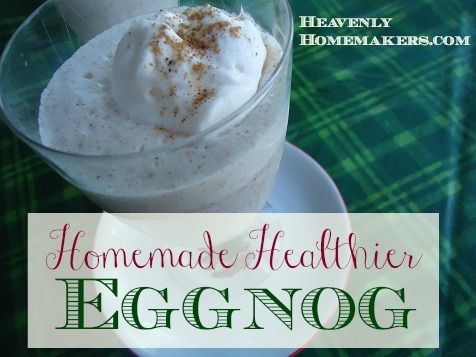 Oooh….I love egg nog but do not indulge so much–this recipe is wonderful! Cannot wait to try it! I do like eggnog, but in small quantities. It is so rich and sweet to me. I am not a fan of eggnog, but my husband and boys love it! I will be trying this recipe over Christmas! I love eggnog but I am the only one at my house so I just don’t buy it or I will consume all of it myself! 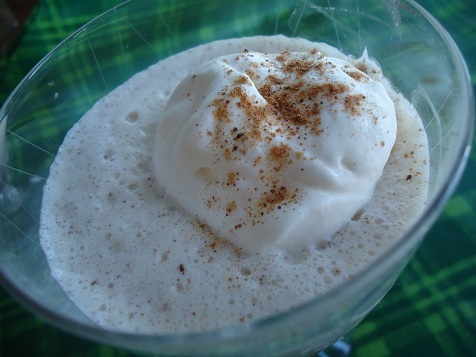 My husband loves eggnog, maybe I should make this for him! We love egg nog and i am making a run for raw milk and farm eggs this afternoon! Can’t wait to tryit! I have never tried eggnog before. Just might have to start. Thanks for the recipe. I never acquired the taste for eggnog but I remember my grandparents drinking it by the gallon. Love eggnog, but not a huge fan of maple syrup. Maybe I could sweeten it with sucanat? I love eggnog. This looks delish! Love, love, love eggnog! I have always had it homemade though… and because of that, have never been a fan of store-bought eggnog. I love eggnog! We traditionally drink it every year when we put up the Christmas decorations. I found a yummy organic brand this year, for which I don’t mind spending a little more. I’m drinking it in my coffee this very minute! I made eggnog a couple of years ago, when we had a little Christmas in July celebration and eggnog was not available for purchase in stores. I will definitely keep this recipe in mind for the future. Thanks! Ok, this may make me sound crazy, but we LOVE eggnog around here…as in we go through quite a bit during the holidays…some to drink and some to freeze…so I can make things like eggnog muffins year round… :) :) I’ve been wanting to make my own to get away from some of the bad stuff…so excited for this recipe…might have to try it NOW!!! My three boys all love egg nog. I am not all that fond of the rich, sweet stuff from the store so maybe this would be a good alternative. I’m going to try and make this for my husband since he loves egg nog! My family has been asking for egg nog – THANK YOU for sharing this recipe; can’t wait to make it. The chickens are moulting right now so I have to use store-bought eggs (sad face). Since this recipe heats the eggs, it’s ok for us to use the ‘inferior’ store eggs, right? Eggnog is yummy! Sounds good! My family loves egg nog. We start the day after Thanksgiving and serve it for the last time New Year’s Eve. My 10 y.o dd just realized this year is has eggs (egg nog). We had to laugh. Will try your recipe tonight. My mom used to make eggnog when I was growing up, and we all loved it! I think I’ll try your recipe and see what my kids think–it sounds yummy! Eggnog is not my favorite thing – not sure why. I can drink it but just a little. But my husband loves it and our friends have a Christmas Eve eggnog tradition. I will have to send them this recipe. My dad loves eggnog but no one else in our family does. I remember having eggnog as a child, but never as an adult. I’m going to try this recipe this week! Sounds delicious! Never have tried eggnog and don’t really plan to, but it looks yummy! Eggnog isn’t my favorite but others in my family love it! I would like to try this way to make it! I’m not really an eggnog person but this looks really good! My husband loves eggnog, but I personally am not a fan of it. Perhaps we’ll have to try this homemade version and see what I think then! I’ve never tasted eggnog, but this looks pretty good. I’ll have to try it! Thanks. I LOVE eggnog. The homemade stuff (like this! ), not the stuff from the grocery store. I can’t wait to serve some up on Christmas eve! I have honestly never tried egg-nog, but might have to try this one. I love using eggnog in baking, like eggnog cookies. I don’t usually like to drink more than a small glass because it is just to rich. This is speaking of store bought eggnog though. I never knew you actually cooked / heated the eggs at all in homemade eggnog which is one reason I never looked into making it before. Not comfortable with raw eggs. this is grand, we love eggnog and this is wonderful now we can make it ourselves. can’t wait to try this recipe. I love eggnog! This recipe sounds delicious! I haven’t had egg not in years. This looks fabulous! Oh, how glad I am to have this recipe! I picked up a bottle of organic eggnog at the store last week and put it down again. I couldn’t bring myself to buy something that had sugar as the first ingredient!! I have never liked eggnog but am confident this will be wonderful. I’ve come across a few other recipes but all used raw eggs. Since we have no chickens right now, I can’t use raw eggs. I will make this for my husband when he gets home from work. It’s nice to have a winter treat that is served cold because sometimes it is very warm in south Louisiana and hot chocolate or warm soothers just aren’t an option! My Husband LOVES eggnog. I would love to make it myself! I made a super delicious Pumpkin Eggnog this year – recipe from The Purposed Heart. It was AWESOME! Don’t really like eggnog, but I think I may try this one. I’m going to try this recipe; my husband likes eggnog and maple syrup. My 2 and 3 year old boys love eggnog, mainly for the “nogstaches” (mustaches). Can’t wait to try this! I don’t really like Eggnog, but then again I have always had store bought stuff! Oh my goodness! Oh my goodness! Oh my goodness! I have to try it! thanks for the recipe…looks good! I love eggnog, but usually “water” it down with milk because it’s so thick. I’d probably like this version better! My husband just told me last week that I needed to learn how to make egg nog! Thanks for sharing this healthy recipe! Even though I don’t like eggnog, I would still like to win a gift certificate! This eggnog looks wonderful. I’m going to have to make for our Christmas. I do like eggnog and have printed this recipe to try. Ive never made my own. This I will have to try. Oh! That recipe just sounds heavenly. Unfortunately, both my boys and my husband are sensitive to pasteurized milk, and 4 cups of raw milk would cost me $7.00 so I won’t be able to use this recipe…but if I COULD, I SO WOULD!!! Oh, my husband is going to love this! He adores egg nog! I am looking forward to trying this – I do not like the taste of commercial egg nog! Thank you for this recipe! I discovered that since we started eating real food, I can’t stand to drink store bought eggnog- it just doesn’t taste real- and definately too sugary! I will for sure share this with my eggnog loving mom! Mmmmmm! Making eggnog is on my to-do list this week! I’ve never tried making eggnog, but maybe I will. It’s a favorite treat! This eggnog recipes looks yummy! I have never cared for egg nogg. BUT this sounds yummy enough to try!!! My husband loves eggnog and he has been feeling I’ll the past few weeks so I am going to try this maybe it will make him feel better. Thanks for the recipe. Mmmm eggnog! I love me some eggnog! I made it for the first time last year. The recipe I used called for raw eggs. I couldn’t get over the raw idea of it and after a few sips-down the drain it went. I don’t think I have ever tried egg nog. Might have to give this a try. Thanks! When do we add the wonderful maple syrup? Before or after cooking? I love eggnog and we make it homemade often around this season (costs WAY too much at the store). We do usually use sugar, but maple syrup is a great idea! Maybe I can try that next time. I personally can’t stomach eggnog, but it’s good to know there’s a healthier recipe if I ever need to make some for family! I don’t think I’ve ever tried eggnog, but this one is tempting me. Sounds great, though I’m still scared of not cooking it properly. It doesn’t say when to add the syrup??? Thanks for pointing that out. I edited the post to include correct instructions…hopefully! I’ve never thought about making my own eggnog…my kids love egg nog. Will try this, and thanks for the lovely recipe share! I love eggnog! I never thought about making it myself. Thank you so much for this. I bet my husband would love this. We just made this recipe and it was terrific!! We drank it warm. Thanks for posting this recipe. Nope, we’re not eggnog drinkers here. But thanks for another chance to win! I’d love to try this! Yum! I just tried making this, and before the temp. reached 160 degrees, my eggnog started looking more like scrambled eggs. What went wrong? I tried using a hand blender after adding the rest of the milk until it started getting frothy. I may use this batch for the eggnog muffins but want to try again. Suggestion? My guess is that it needed to be stirred more while it was heating. Hopefully it will work better this time! My husband loves eggnog – think I will try this for a Christmas surprise. Thank you so much for this site – it has been such a blessng to me. Have a very blessed Christmas. I’ll be making this often, now that I found the eggnog muffins! I want to give this a try as my husband LOVES eggnog but I shudder at buying the store bought kinds b/c of the ingredients. You are a gem ! I have been craving eggnog but alas its difficult to find without corn syrup- ugh. Thank you thank you ! Can’t wait to try it !! Never tried making it before, looking forward to trying it! This will be the perfect treat for a winter movie night. Where do you get your maple syrup? Can leftovers be refrigerated? Shake leftovers due to seperation? Thanks! How many servings does this make? How many ounces per serving? This makes 6-8 servings of about 8 ounces each.